There is a plethora of flight booking websites in India: MakeMyTrip, Yatra, Ixigo, Ezeego etc. I have tended to mainly use MakeMyTrip. That is, until now. 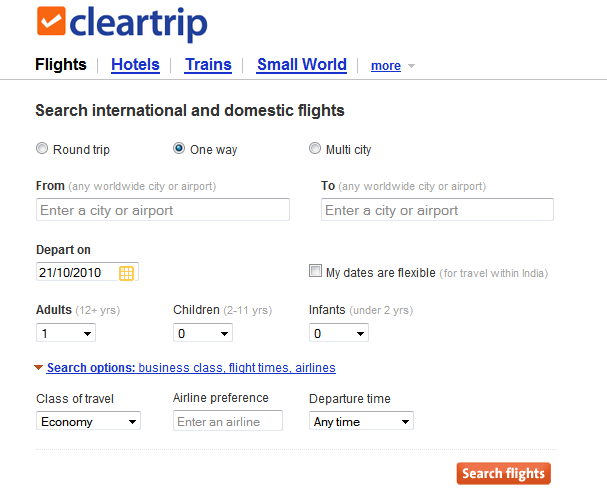 Enter Cleartrip which delivers, simply put, a great user experience. Let me highlight some things I like. The layout and navigation are simple, uncluttered and clear. Good use of whitespace. The visual design is obviously inspired by Google. Who better to ape? UX Lesson: It’s easier to type when the user has to choose from lots of data. Typing is easier than pointing and clicking. 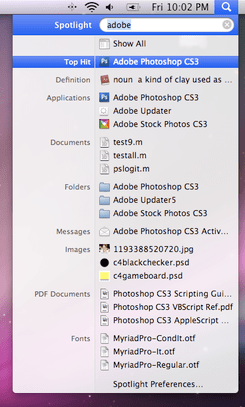 That’s why I think Spotlight is so awesome and Desktop Search is the killer feature in Windows 7. The site feels quite snappy (much faster than the other sites out there). UX Lesson: Performance is a key part of the overall user experience. 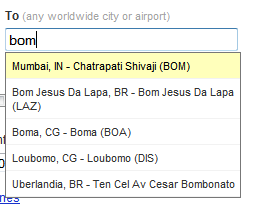 I was searching for some flights but got interrupted and when I went back to the site it remembered the details of my last search. Note that I didn’t create an account – it just remembered. I didn’t have to create an account to book my flights. I just needed to provide the minimum information required to make a booking and pay for the flights and I received an email with my ticket details. What happened next is great. I received a separate email saying that an account had been created using the basic information I have provided at the time of booking. I had the option to activate the account by providing a password and some additional details. This is a great example of breaking down barriers to using your application. UX Lesson: Be smart about the information you collect and remember it so that the user doesn’t have to retype it. UX Lesson: Don’t force the user to create an account unless absolutely necessary. Everyone hates creating accounts. Nobody wants to keep track of yet another username and password. So the best thing you can do is simply to let the user use an account he already has. 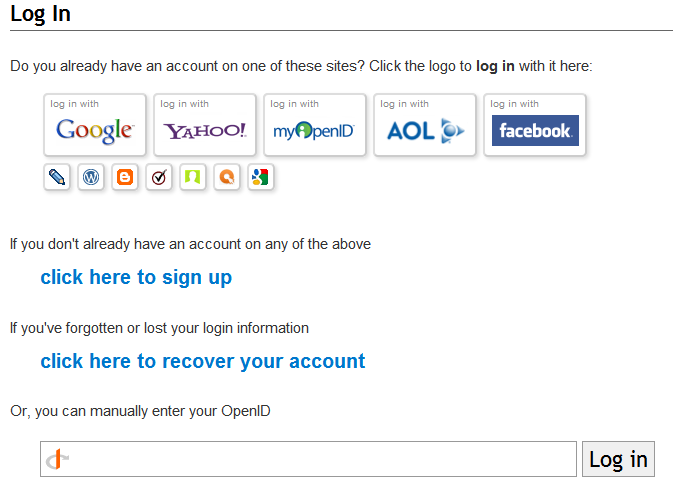 OpenID seems to be the de-facto way to achieve this and StackOverflow does an excellent job. Kudos to Jeff Atwood. If I log in, I can see a list of upcoming trips and cancel tickets. I can also apparently see the refund amount before I cancel but this didn’t work for me because of some fare code information not being updated or something. But at least Cleartrip was good enough to give me a plausible reason for this feature not working as advertised and provide customer service contact details. UX Lesson: UX is about paying attention to lots of little things that all combine together to make a big difference. The user experience is my no means perfect. For example there are some interesting innovations like Graphs but they didn’t work. 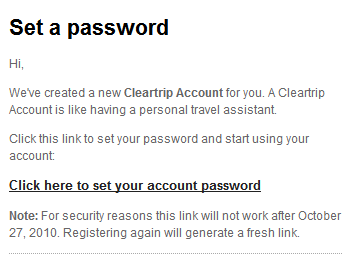 But the point is that the few things that stand out are enough for me to switch over to Cleartrip. They show that they have put real thought into making the booking experience simple and hassle-free. The cost for me to switch is minimal so I will. But if something better comes along I’ll switch again. So in order to be competitive and stay competitive it’s not enough just to design for UX upfront but instead to to view it a continuous process. I therefore think that organisations that integrate UX design into the development process will win. It’s been a while since I’ve posted to this blog, so first things first, I’d like to bring you up to date. After moving from Melbourne to London and spending a year there consulting to Earthport and working with Thomsons I have moved to India and joined Infragistics as a Technical Evangelist. A technical or technology evangelist is a person who attempts to build a critical mass of support for a given technology in order to establish it as a technical standard in a market that is subject to network effects. Thanks to my colleague Tony Lombardo’s excellent insights, and the benefit of having spent a few month on the job I think I have a fairly good understanding this dynamic and exciting role with elements of sales, marketing and business and technology innovation. As I see it, a Technical Evangelist’s role is to engage and inspire potential users of the technology. This is done through various forms of communication. In my case: presentations, demos, talks, proof-of-concepts, sample code, blogs, articles, phone calls, emails, social media and the occasional bit of technical support. Because Infragistics primarily sells development software, I communicate with developers, architects, project managers, product owners , business analysts and senior managers. I speak different languages to each user so in a day I could be talking to an architect about streaming realtime data to a browser-based application using push technologies and then to a manager about agile methodology and the value of UI prototyping. I strive to put myself in each user’s shoes and understand what is important to them so I have a context in which to communicate effectively. My background in software development, consulting and entrepreneurship helps me immensely in this. Being a Technical Evangelist is also a continuous learning process. Apart from keeping up to date with Infragistics products and trends in the .NET/Microsoft ecosystem, I make an effort to to aware of software, technology and business trends at large. I present demos to teach about the product, and why I think it’s great. I’m showing you how to accomplish a task using the product. When I build a sample, I’m not just building another test project. I’m demonstrating the capabilities of a product that have the potential to change your job, or at least make it easier. One of my heroes, Guy Kawasaki is a former Apple Technical Evangelist and is noted for having brought the concept of evangelism to the high-tech business. Here are some words of wisdom from the man himself: The Art of Evangelism. Incidentally I also use Guy’s 10/20/30 rule for my presentations. I hope this gives you a better understanding of what a Technical Evangelist is. I look forward to sharing my thoughts on user experience, software development with Infragistics/.NET and business and technology in general.